Brown ground beef in 12-inch nonstick skillet over medium-high heat until thoroughly cooked, stirring frequently. Drain. Add soup, tomato sauce, Worcestershire sauce and hot pepper sauce; mix well. Stir in rice and water. Bring mixture to a boil. Reduce heat to low; cover and simmer 15 to 20 minutes or until rice is tender and liquid is absorbed, stirring once or twice. eanwhile, cook broccoli to desired doneness as directed on package. Drain; set aside. 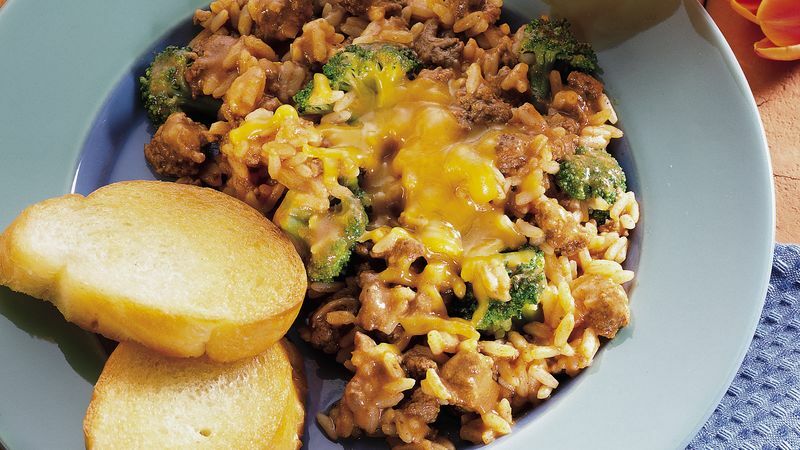 Stir cooked broccoli into ground beef mixture; mix well. Sprinkle with cheese. Cover; cook an additional 5 minutes or until cheese is melted.